A major Philadelphia petrochemical company had a problem. Actually, it had more than one. The firm recently acquired an old phenol plant from a competitor. The facility was run down and didn't meet the high safety standards required by its new owners. That meant some serious revisions. Figure 1. Because of the criticality of the flow measurement, the phenol manufacturer painted a key component of the meter red. "The plant is more than 100 years old. There were problems all over the place," said Mike, the new owner's reliability engineer. "We started by cleaning all of the equipment. It was a huge task, but we knew what shape the plant was in when we bought it. One cooling tower was in such bad shape that cleaning it was hopeless. We simply replaced it." Demand for phenols continues to grow because they are important intermediates in chemical manufacturing, particularly for producing precursors to plastics. This particular plant uses the cumene process, which makes phenol by reacting cumene with oxygen in the presence of an acid catalyst. Phenol at the production temperature of 300°F is a viscous fluid like cold maple syrup. As it cools, the fluid thickens; if it drops below 105°F, it solidifies. Therefore, to prevent severe damage to the plant's equipment, the phenol can't be allowed to cool too much. It's maintained at a temperature slightly below 300°F until shipped. Phenol's toxicity poses another serious concern. The chemical is very hazardous — exposure to it can be fatal if untreated. It absorbs quickly through the skin and attacks the central nervous system as well as the liver and kidneys. So those dealing directly with phenol must wear hazmat gear to avoid touching or inhaling it. When acquired, the plant was using differential pressure (dP) flow meters. Such meters place a restriction within the pipe, often an orifice plate, which creates a pressure drop; an increase in flow raises the pressure drop and vice versa. By measuring the pressure before and after the restriction, the transmitter can determine the flow rate via Bernoulli's equation, which relates fluid velocity to pressure. "In one building, there are two coolers, one larger than the other, and they both had orifice plates with dP flow meters," noted Mike. "In the smaller cooler, the orifice plate was too restrictive, so it was replaced with a self-contained differential flow meter. It was intrusive, too, but didn't restrict the flow too much. However, the meter got plugged fairly quickly, so we routinely removed it, disassembled it, cleaned it and reinserted it. It was tedious and time consuming. It was also dangerous. The technician had to wear hazmat equipment when removing it, cleaning it and replacing it. 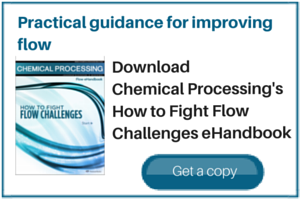 Early on, we started looking for a non-intrusive method of monitoring the flow of phenol." The plant asked Jim Pletcher from Technical Devices, Inc., one of its major suppliers and a technical consultant, if he had any ideas. "It looked like a great application for one of our suppliers, Flexim Americas," said Pletcher. "They make ultrasonic flow meters with remarkable range. Their turndown ratio is 100 to 1, where a differential pressure flow meter is about 30 to 1. Plus, they are clamp-on meters and do not intrude into the flow." "One of the major benefits of ultrasonic flow meters is that, unlike traditional meters, they contain no moving parts and do not need frequent calibration and maintenance," explained Pletcher. "Measurements are made using the transit time difference method. It exploits the fact that the transmission speed of an ultrasonic signal depends on the flow velocity of the carrier medium. An ultrasonic signal moves slower against the flow direction of the medium and faster when it is in the flow direction. "For the measurement, two ultrasonic pulses are sent through the medium, one in the flow direction and the second against it. The meter's transducers work alternately as transmitter and receiver. The transit time of the signal sent in the flow direction is shorter than that of the signal sent against the flow. The meter measures the transit time difference and calculates the average flow velocity. Since the ultrasound signals propagate in solids, the meter can be mounted directly onto the exterior of the pipe non-invasively. "Flexim ultrasonic flow meters are not affected by density, which make them ideal for multiple applications from slurries to gas measurements. They automatically compensate for variations in viscosity." In May 2013, Pletcher gave a presentation and brought along a portable Flexim meter. "Initially, he showed us a hand-held portable that we put on a pipe and it gave us the reading we thought we should have," noted Mike. "We put it on different types of liquid and it gave us the good readings we were looking for. It also calibrated itself. We decided to use it for information, not control. We've got a system installed at a location and it works just fine. When we first installed it, we left the differential flow meter in place so we could check the measurements over time. The differential meter was a lot more noisy; it read higher flow than the Flexim. And the measurements would drop over time as it plugged. The ultrasonic gave us good, flat readings with minimal noise. For three months we tested it and then installed it permanently. It is now one of the plant's safety interlocks and is still giving accurate, noise-free measurements. And we don't have to take it out to clean it." PETER CHIRIVAS is senior staff engineer and quality control manager at Flexim Americas Corp., Edgewood, N.Y. E-mail him at pchirivas@flexim.com.